Expression ET-2500 EcoTank All-in-One ($379). For the home, with an in-box ink yield of up to 4,000 black and 6,500 color pages and print speeds of up to 9.2 ISO ppm (black) and 4.5 ISO ppm (color). The ET-2500 offers easy one-touch copying to get high-quality copies fast, and a 100-sheet paper capacity. Expression ET-2550 EcoTank All-in-One ($399). For the home, with an in-box ink yield of up to 4,000 black and 6,500 color pages and print speeds of up to 9.2 ISO ppm (black) and 4.5 ISO ppm (color). The ET-2550 features a 1.44-inch color LCD, PC-free photo printing with a built-in memory card slot, and a 100-sheet paper capacity. It also includes built-in Wi-Fi Direct, and easy printing from iPad, iPhone, tablets, and smartphones. WorkForce ET-4500 EcoTank All-in-One ($429). 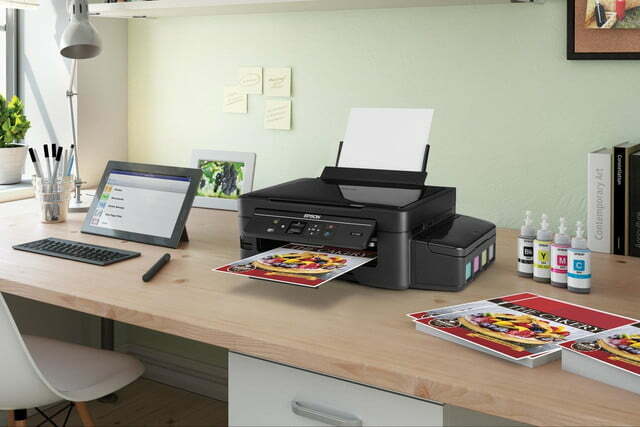 For the home office, with an in-box ink yield of up to 4,000 black and 6,500 color pages and print speeds of up to 9.2 ISO ppm (black) and 4.5 ISO ppm (color). The ET-4500 features a 30-page ADF, a 100-sheet paper capacity and a 2.2-inch LCD. It also includes built-in Wi-Fi Direct, and easy printing from iPad, iPhone, tablets, and smartphones. WorkForce ET-4550 EcoTank All-in-One with PrecisionCore ($499). For the home office, with an in-box ink yield of up to 11,000 black and 8,500 color pages, high-speed, laser-quality black text, and print speeds of up to 13 ISO ppm (black) and 7.3 ISO ppm (color). The ET-4550 features 2.2-inch LCD, auto two-sided printing, a 30-page auto document feeder (ADF), and a 150-sheet paper capacity. WorkForce Pro WF-R4640 EcoTank All-in-One with PrecisionCore ($1,199). For the small business, with an in-box ink yield of up to 20,000 black and 20,000 color pages and print speeds of up to 20 ISO ppm (black) and 20 ISO ppm (color). The WF-R4640 delivers Performance Beyond LaserTM, producing print-shop quality prints with up to 70 percent lower total printing costs vs. color laser. 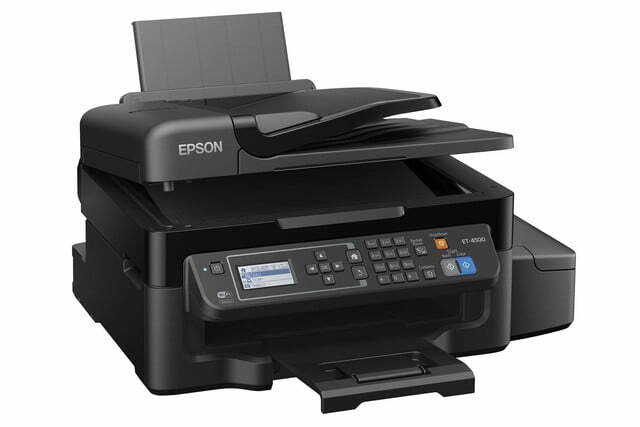 It features a 580-sheet capacity, auto two-sided printing, copying, scanning, and faxing, and a 4.3-inch color LCD. 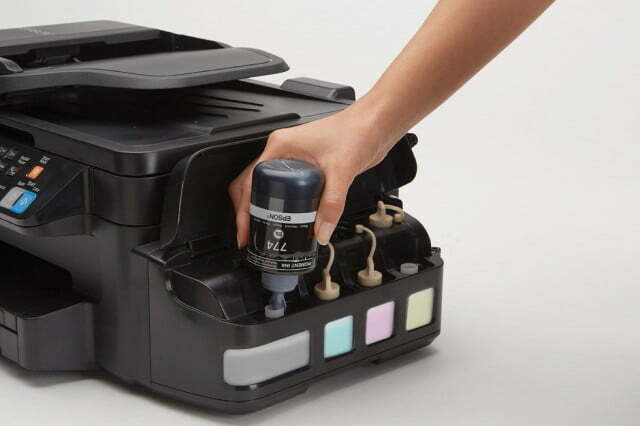 EcoTank printers have ink reservoirs that users can refill, using ink bottles. Running out of ink is one of the most frustrating things about printing. Color prints come out uneven because an ink tank ran dry, or, worse, it renders the printer completely unusable. 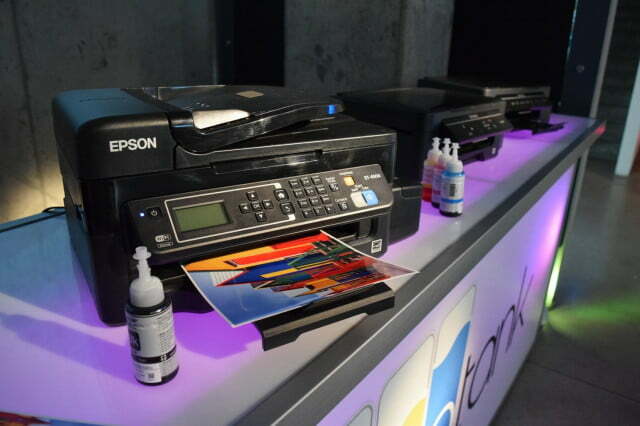 Epson new inkjet printer system, called EcoTank, is designed to alleviate this problem. EcoTank printers, which are designated “Supertank,” have large-capacity ink reservoirs that offer up to two years of prints, before they need to be refilled. The printers will be in stores in September. 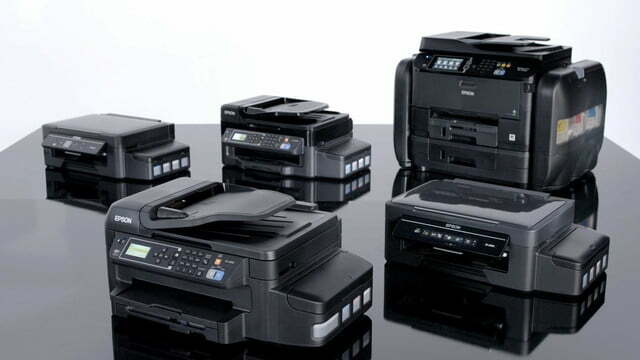 Printer manufacturers commonly use the “shaving razor cartridge” approach, in that they sell a printer at a lower cost, but make up the profit in ink cartridges. For those who print a lot, whether it’s a small or home business or a family that prints homework and photos every night, printing gets costly. 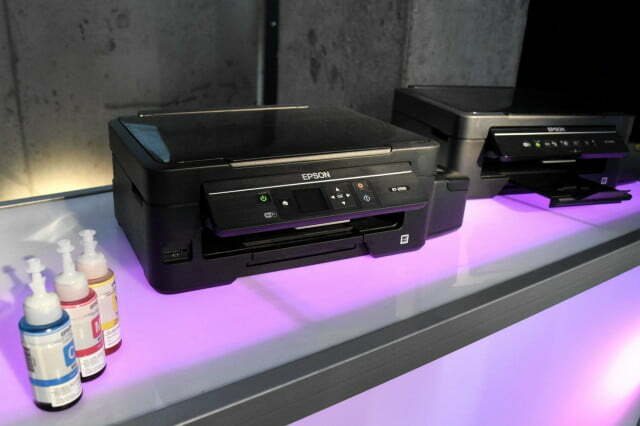 Epson President Minoru Usui, during a launch event in New York City on August 4, says EcoTank is a breakthrough product that will disrupt business printing in the U.S. market. The EcoTank system, while new to the U.S., is already available worldwide, mainly in so-called developing countries, where customers purchase based on long-term value, and are willing to pay more up-front. One reason for bringing EcoTank to North America – a $40 billion printing market, according to IDC – is to make color printing more accessible and affordable. According to InfoTrends, 90 percent of prints in the U.S. are monochrome, because color ink cartridges are pricey. Each color ink bottle costs $13, or $52 for a set, and is estimated to last up to two years. Not only could this encourage users to print more, they could print more in color. And, since ink is more affordable, users wouldn’t need to seek out third-party inks, as is commonly done with ink cartridges. 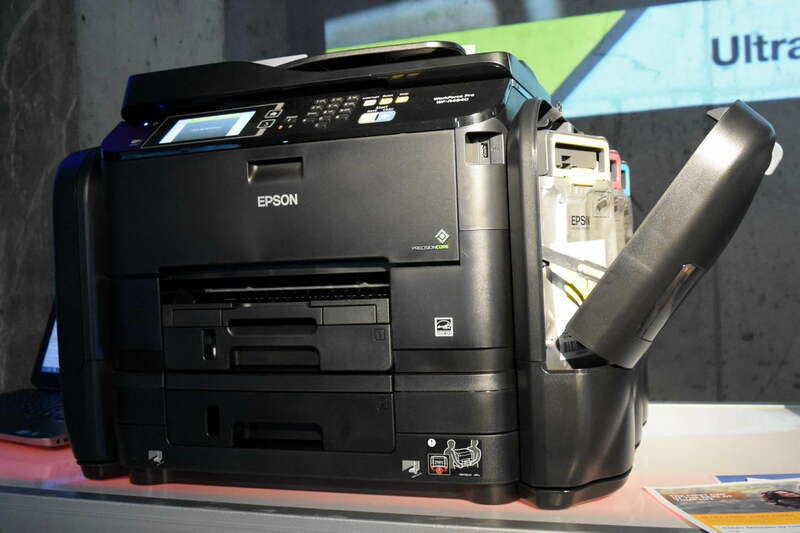 Usui also says the product reduces waste and packaging, and Epson is positioning the higher-end models for laser printer replacements, as the “printer of choice” in offices. EcoTank is being introduced in five multifunction devices within the WorkForce Pro and Expression series. 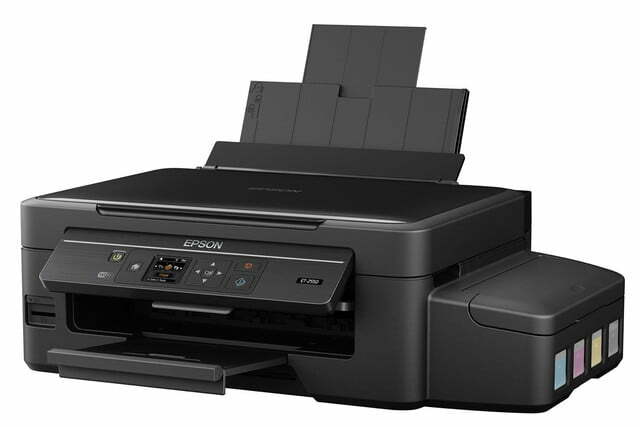 Two WorkForce Pro models use Epson’s PrecisionCore printhead for fast and ink-efficient prints (ideal for small businesses or home offices), while the Expression targets home users. Each comes with a two-year warranty and Wi-Fi-ready. The printers look nearly identical to non-EcoTank models, however there’s a sizeable ink compartment attached, so each printer takes up more desk space. When we asked Epson if the EcoTank models would cannibalize or affect the sales of traditional inkjet printers, Epson says the market would support both types of printers, as there will still be buyers who want a cheaper model and don’t mind pricier cartridges (for example, home users who print occasionally). 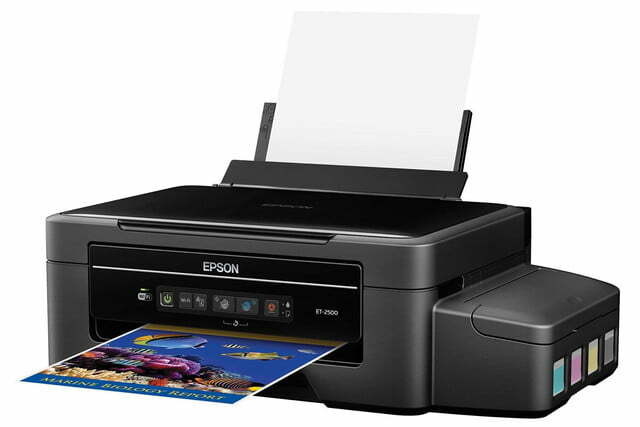 Also, users who print high-quality photos may prefer Epson’s “art” printers, as the EcoTank printers are more for documents (although they should be able to handle photo prints, as well). 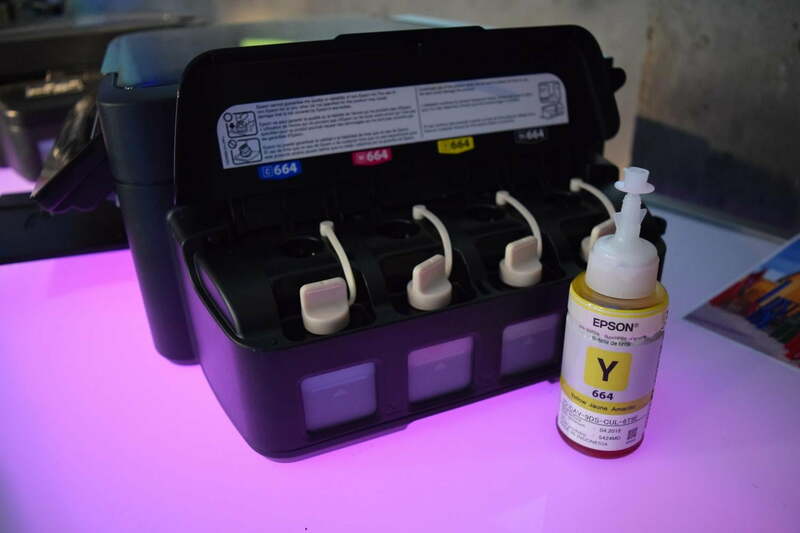 With EcoTank, Epson is after those who not only print often, but also would like to do so in color but have held off due to high cost of supplies. However, with consumers conditioned on the razor cartridge concept, we are curious to see if they’d be willing to pay more for a printer, for the return of higher yields and cheaper ink. For the small business, with an in-box ink yield of up to 20,000 black and 20,000 color pages and print speeds of up to 20 ISO ppm (black) and 20 ISO ppm (color). The WF-R4640 delivers Performance Beyond LaserTM, producing print-shop quality prints with up to 70 percent lower total printing costs vs. color laser. 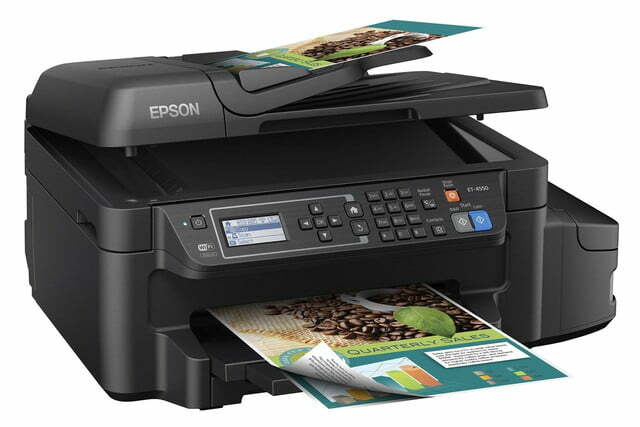 It features a 580-sheet capacity, auto two-sided printing, copying, scanning, and faxing, and a 4.3-inch color LCD. For the home office, with an in-box ink yield of up to 11,000 black and 8,500 color pages, high-speed, laser-quality black text, and print speeds of up to 13 ISO ppm (black) and 7.3 ISO ppm (color). The ET-4550 features 2.2-inch LCD, auto two-sided printing, a 30-page auto document feeder (ADF), and a 150-sheet paper capacity. For the home office, with an in-box ink yield of up to 4,000 black and 6,500 color pages and print speeds of up to 9.2 ISO ppm (black) and 4.5 ISO ppm (color). The ET-4500 features a 30-page ADF, a 100-sheet paper capacity and a 2.2-inch LCD. It also includes built-in Wi-Fi Direct, and easy printing from iPad, iPhone, tablets, and smartphones. For the home, with an in-box ink yield of up to 4,000 black and 6,500 color pages and print speeds of up to 9.2 ISO ppm (black) and 4.5 ISO ppm (color). The ET-2550 features a 1.44-inch color LCD, PC-free photo printing with a built-in memory card slot, and a 100-sheet paper capacity. It also includes built-in Wi-Fi Direct, and easy printing from iPad, iPhone, tablets, and smartphones. For the home, with an in-box ink yield of up to 4,000 black and 6,500 color pages and print speeds of up to 9.2 ISO ppm (black) and 4.5 ISO ppm (color). 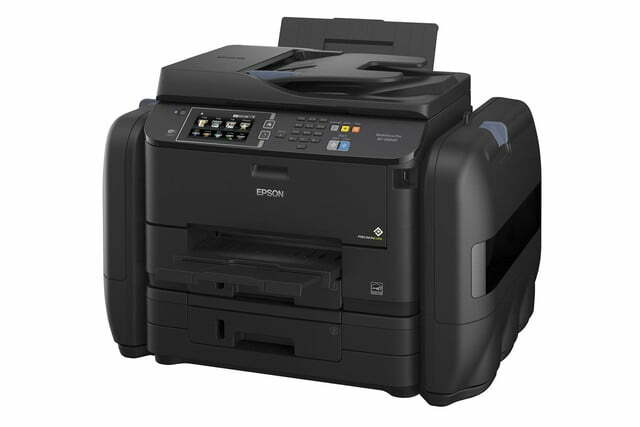 The ET-2500 offers easy one-touch copying to get high-quality copies fast, and a 100-sheet paper capacity.